Thanks for the chance at this great giveaways, it would be great to have any of these great reads to have after I finish my exams and then graduation!! I hope that you are having a wonderful spring, I love all this time of year when everything starts to look more alive after the lond and dreary winter!!!! Me too! I love the cherry blossoms! All those books look so amazing. It'll be a hard choice for the winner! Hope you're having an excellent spring. Your blog is really great! I love seeing your new posts come into my feed each day! Thanks for keeping a fun blog! You also host wonderful giveaways! I love great book bloggers like you! Thanks! Aw, thanks Inky! I love reading when you post too! i enjoy your blog- thanks for the chance to win! Thank you for the giveaway! Really great choices! All these books look really good! I recently bought Starters just haven't had the chance to read it yet and I'm just starting the audiobook of Divergent to get ready for Insurgent. Great giveaway! Amazing list of titles! Thank so much for the chance to win!! Thanks for the giveaway. Have a nice week. Everyday, wake up and look out your window and realize how lucky YOU are to be YOU and be ALIVED and to be BLESSED! Thank you for this giveaway! Have a GREAT day! Thank you for the giveaway! All of these books look really good! Hope this May proves to be your best one ever!! I'll leave a quote I find amazing "Creative adults are the Children who survived." it's amazing! Oh, that is a good quote! There are so many new awesome releases! Thank you very much for this amazing giveaway. o.O Where would one find this phenomenon of delight?! Thanks for the giveaway! There are a couple books on that list that I am super excited for!! Something wonderful. Perhaps a tall order for me. I'm looking forward to palnting my garden. Sounds wonderful to me. Thanks for making the giveaway open to Canadians! That sounds wonderful to me! What are you planting? Thanks for having this giveaway! I'm definitely looking forward to this spring since there's so many good books that are being released! Thanks for the giveaway, I hope you have a fabulous spring! I hope you get to enjoy this spring. This is a wonderful giveaway! I wish you best to luck with all your works in progress. Thanks for the giveaway! I'm especially excited about Insurgent... I just got around to reading Divergent, and so far it's amazing! Thanks for the great giveaway. Wishing you the best for all your creative endeavors. Thank you for the opportunity to enter the giveaway. Thanks for this amazing giveaway - I would love to win! The weather is warmer and the flowers are blooming! Yay! I'm so excited for Insurgent and Bitterblue! 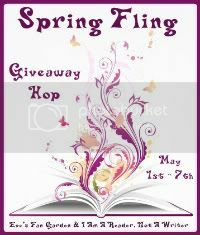 It's wonderful to start the spring with an awesome giveaway! I'm so excited about new releases! Thank you for the giveaway! Thank you for the giveaway!! There are a couple books... I want them!! All of these books look amazing! Love the covers. Thank for making it ww. Thanks for the FAB giveaway! Have a WONDERFUL weekend. Good luck to everyone! May Books Abound! Spring is here and spring is nature's way of saying its party time...njoy! Thanks a lot for another great giveaway! I really like your choice of books. thanks for the giveaway, great books! I love your choices of books, all of them got some awesome reviews. It is turning autumn here now and after having a extra warm summer it is very welcome. Enjoy your spring reading nice books in the warm sun outside!! You have some amazing books picked out! What a great giveaway, and wonderful selection of books. Thank you for taking part in the hop and for the awesome giveaway!! Thank you for the giveaway! :) I love the choices! Sparkly thanks for this awesomeness! Here, have something absolutely adorable! Omigosh! Crazy music and super cute animals! Thanks for the awesome giveaway... you rock! Hahah! I like the thin box best! Thanks for an awesome giveaway! Would love to win Insurgent! Wonderful books - A lot of amazing books to pick from!! Thank you so much for the giveaway! I definitely have my fingers crossed! This is the start of a great week! I have work this week, some great meetings that I am looking forward to, a service activity, a cast party for the Jr. High play that my daughter just participated in (I helped with concessions so I get to go! ), and it is Mother's Day! It will be a great day even though my Mom is all the way in Uruguay. So grateful for Skype!! Here's hoping you have a wonderful week too!! It's a gorgeous day out! The trees are all green, the flowers are blooming, the birds are singing! I think I will go on the patio and read a book!!! Thank you for the excellent giveaway. It's a beautiful spring day here today and hopefully the same tomorrow. Thanks for participating in such a great hop! I love finding new authors/series to add to my TBR list! What wonderful choices! it's really awesome of you to participate in the giveaway! I love you, you, Blogger, you! (That positive enough?) LOL. Thanks for the giveaway!